Editor/Author Cannon, P.F. 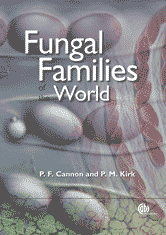 and Kirk, P.M.
Portrays the immense diversity of the Kingdom Fungi. As well as basic information on all currently recognised families, detailed entries are provided on key families, describing their morphology, ecology, phylogeny, distribution and economic significance.